Last week, General Secretariat of the SAMARITAN INTERNATIONAL (SAM.I.) has officially opened its office in Rue de Pascale 4 in Brussels. The event was supported by President of the European Parliament, Martin Schulz and Chairman of the Arbeiter-Samariter-Bund, Knut Fleckenstein. The opening was attended by Secretary General Ivo Bonamico, representatives of ASB – SEE and numerous guests from the network’s member organizations. Before the opening, they had taken part in a meeting of the advisory committee. „With our new office close to the European Parliament we intend to strengthen our political work“, Ivo Bonamico explained. After the ceremony of opening, the delegation joined Fleckenstein in EU Parliament to meet President Schulz. Together, they handed him the recommendation paper “Single European First Aid”. The paper, authored by the EC First Aid, asks for political support in advancing the cross-border recognition of first aid certificates in the EU and recommends approaches to address this matter. SAM.I. 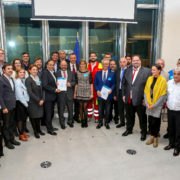 is recognized as a mediator between European institutions and the member organizations, through many years of active participation in addressing EU political matters, such as refugee policy, social services or the development and implementation of European standards in emergency care and first aid.